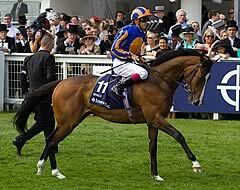 The Aidan O’Brien-trained Seville went into the recent Group 2 Sportingbet.com Great Voltigeur Stakes as the solid 3/1 ante-post favourite for the world’s oldest classic, but three minutes later plans were immediately under review after the son of Galileo finished a modest third to runaway winner Sea Moon, writes Elliot Slater. Those looking forward to the 2011 St.leger betting might be interested in this. Sent off the 5/6 favourite to cement his position at the head of the St Leger market, Seville appeared to have matters under control as he travelled sweetly in the hands of young Joseph O‘Brien, settling well in fourth place as his stable companion and pacemaker Regent Street blazed away up front ensuring the mile-and-a-half contest would not be run at a dawdle. Turning for home Regent Street quickly came back to the field and Seville moved up without any apparent effort to pass the early pace setter just as the Sir Michael Stoute-trained Sea Moon and Godolphin’s Hunter’s Light also joined battle at the head of affairs. After travelling strongly throughout O’Brien pushed the button when Sea Moon began to edge to the front but the response was very disappointing, Seville soon coming under pressure and looking woefully one-paced as Sea Moon easily stretched away under Richard Hughes to rout the opposition. Al Kazeem eventually proved more than two-lengths too good for Seville to claim the runner’s-up spot with the favourite a well beaten third. Those involved in horse betting could be encouraged by this. On the face of it there appeared no obvious excuses for the Ballydoyle colt who had previously run two tremendous races in finishing a close second in both the Irish Derby and the Grand Prix de Paris. O’Brien was unable to offer any immediate explanation for the below-par effort and bookmakers have now pushed Seville out to as big as 10/1 as confidence in his St Leger credentials ebbs away.